The work of Filacchione et al.,published in the November 17th 2016 issue of Science, to which have contributed scientists from the Paris Observatory, concerns the detection of CO2 ice. As comet 67P/Churyumov–Gerasimenko approached the maximmum of its activity last year, Rosetta was able to see a part of the surface was covered by dry ice, which had never before been observed on a comet. The shape of comet 67P/Churyumov–Gerasimenko is complex; moreover, its orbit is extremely elliptical and its rotation axis is inclined. Consequently, the seasons do not have the same duration on the two hemispheres of this dumb-bell shaped body. During the 5 and a half year long northern hemisphere summer, the southern hemisphere is plunged in winter. This latter is hardly illluminated by the Sun for 6,5 years, i.e. for a large fraction of the cometary year. However, just before perihelionC - the point on the cometary orbit closest to the Sun - the seasons change.. The southern hemisphere is then plunged into a short, but intense, summer. Rosetta reached dthe comet in August 2014 during the southern winter, when a large fraction of the atmosphere was plunged in the polar night. These regions were gradually illuminated during the first half of 2015, as the comet approached perihelion, which it reached on August 13th 2015. Staying with the comet, the probe saw the increase in its activity: water vapur and other gases, raised the dust on surface layer as they left the nucleus, revealing the underlying ice. In particular, in March 2015 the spectro-imager VIRTIS detected, on two separate occasions, a region covered in dry ice on the southern hemisphere, in the Anhur region. “We know that comets do have carbon dioxide gas, which is one of the most abundant components of comets, but it is very hard to observe it in the solid state on a surface,” explains Gianrico Filacchione of the INAF-IAPS, in Italy, who led the VIRTIS observations. Dry ice, the carbon dioxide in the solid state, is abundant in the martian polar ice cap. Dry ice is in fact often used on Earth, since it freezes at -78,5°C, i.e. at a much lower temperature than water, which it why it is a standardcoolant. 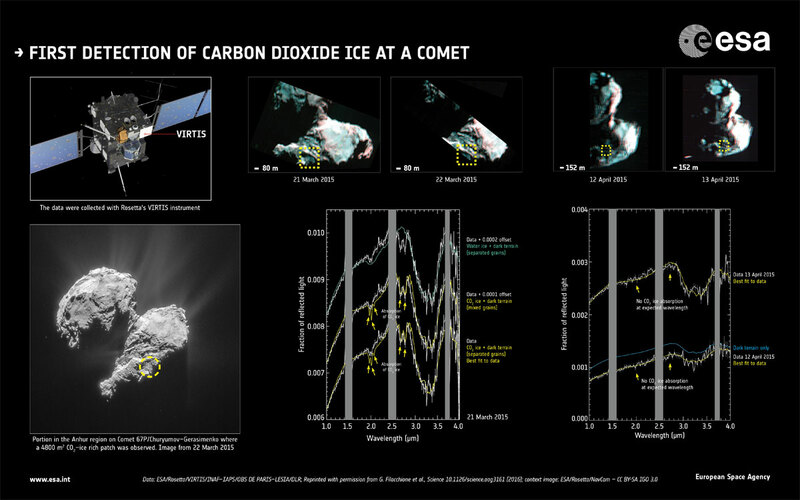 The very low sublimation temperature of carbon dioxide explains why it is so hard to detect it on a cometary surface. Conversely, water ice has been found on various comets, and Rosetta did detect many small regions of water ice on certain parts of 67P/CG. “We had hoped to find traces of dry ice, and we had looked for it for a long time with the help of VIRTIS, but in fact we were quite surprised when we did finally detect its characteristic signature in the spectra” added Gianrico. This zone, made up of a few percent of dry ice, mixed with a much darker organic material, was observed for a few consecutive days. However, when the team studied this region three weeks later, the dry ice had disappeared. On the hypothesis that all the ice had been transformed to gas, the scientists have calculated that 80 x 60 metre area – almost the size of a football field – contained about 57 kg of carbon dioxide, in a 9cm thick layer. Its presence on the surface is probably a rare phenomenon, since much of the dry ice is trapped in the deeper layers of the nucleus. Gianrico and his colleagues believe that the icy patches date from a earlier perihelion pass of the comet, in 2009, when part of the carbon dioxide gas coming from within the comet condensed on the surface. It stayed there, frozen, for several years, as the comet returned to the cold outer parts of the solar system. It began to submime only in April 2015 as the surface temperature started to rises again. This bears witness to a seasonal cycle of the carbon dioxide, over a period of six and a half years, during the orbital period of the comet, in contrast to the daily water ice cycle, which was also observed by VIRTIS soon after its arrival in the neighburhood of the comet.